First, I'd like to thank all of you who helped support my itty bitty initiative to raise money for the good work the Red Cross is currently doing to aid Haiti. Together, you helped raise $77 in a 24 hour period. Yay! For a list of comprehensive organizations currently taking donation for Haiti, click here. Today is Friday (WAHOO!) and it's giveaway time! This weeks giveaway comes to us from the very lovely Rachel Follet, creator of Lovely Clusters and owner of Design Lovely, a papergoods shop. If you're not familiar with Lovely Clusters and the work that Rachel is doing with the handmade community, then you must stop what you're doing and go visit now! 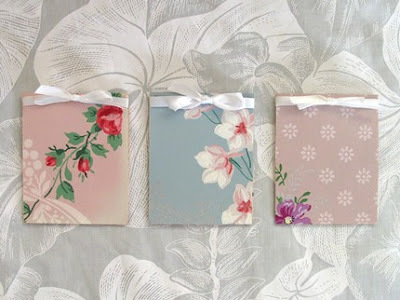 Remember the vintage wallpaper jotters I blogged about here? Well, now you have the chance to win a set of your own but first let's take a peek at the options. 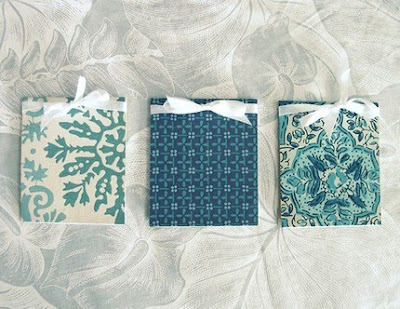 These little jotters are the perfect size for you pocket or bag and the winner will get one set of 3, your choice. I kept two and gave one to a friend because they make the perfect little gift. If you like these, you'll also like the assortment of notepads and magnetic clips available in the shop. 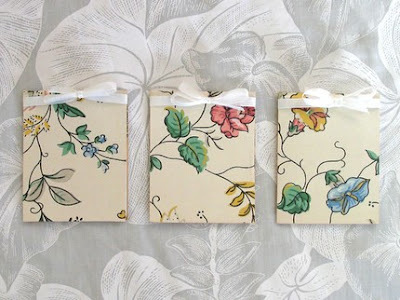 I love Rachel's re-purposing of vintage wallpaper to create these fun and useful products and I'm sure you will too. This giveaway is open to everyone! 1. Visit Design Lovely and tell me what you think. Do you have a favorite item? 2. Are you a follower/reader of D&OC? That's awesome, you get a second entry. Simply say, "I'm a follower." 3. Tweet, Blog, or Facebook about this giveaway and let me know you did. Make sure to leave a SEPARATE comment. 3rd entry. Have a very happy weekend! Winner will be announced next Wed morning. Cool - I like the vintage patterns used. 2nd entry - I'm a follower! That's awesome about raising money for Haiti! I like the vintage jotters in the red wall paper like look. I also like the bunting in the red wall paper. great work on raising all that money! I love Lovely Clusters! 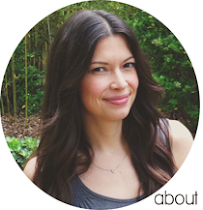 She has a beautiful blog and sells amazingly pretty things! thanks for the giveaway!! The flower collecting greeting cards are beautiful! Haven't entered a give a way in a while, now's the perfect time to start. These are LOVELY. Went to the website and I just love the second jotters you have posted! i love all the vintage prints! I would love the magnet clips! Perfect for my tiny dorm room fridge. Hey! I'm a follower! I really like the blue patterns for the jotters! Have a great weekend! I like those blue wallpaper jotters! so pretty! 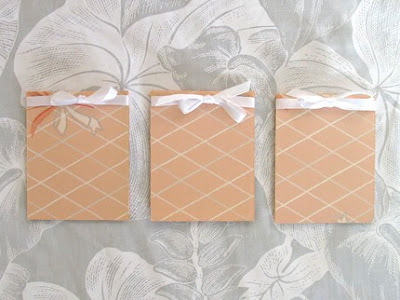 The Pink Vintage Dress card is quite cute... and all of the jotters, love them!! The blue ones are too cute! That is so awesome you raised that much money! WOohoo! Thank you for doing this giveaway on your beautiful blog and for all of your kind words! I'm a big fan of Lovely Clusters! What a great giveaway! Have a Bright, Bold, and Beautiful weekend!! aww this little card is SO CUTE!! Love Rachel's work & I've purchased one of her pretty cards before. Her new jotters are definitely a favorite of mine now, too. These are perfect for my purse! I love the patterns. Ooooo! Those are so pretty! Yeah, I've got to get my entry in. I'm a follower through the RSS feed to Google Reader. 1. bravo for raising money for Haiti! 2. 3rd entry - Lovely Clusters' design! All her items are lovely. I think my favourite is the set of jotters that you have second in your photos above. I love all the wallpaper jotters because I'm constantly looking for little places to write things down on. those are beautiful, i love them all!!! Yay, I adore Rachel & Lovely Clusters! The vintage wallpapers she uses are so sweet. The florals are my favorite.